The location is great! And the owner,Lambros, is very nice and helpful. There’s a pool and beach right next to the hotel and the pool turns into a nightclub at night. The place was very clean and centrally located. Walking distance to the shops, restaurants, beaches and the harbor. The host Lambros was very nice and accommodating to all our needs. He was very helpful telling us about places to go and see. This place us right in the heart of the Hersonisos. You can't go wrong with this place from location stand point. Also it's very clean and has all you need and best value for the price you pay. The owner is wonderful person and he cared for us like a family member started from the day we booked till the last minute to make sure we get the right transportation service to airport at right price. I'd highly recommend this place if you plan to stay in Hersonisos. Wonderful place thanks a lot Mr Lamvros for all the accommodations and hospitalities. BTW the palm beach is right next door to this apartments and is great beach with great bar for nightlife. Hospitality. The owner was very friendly. And there is a pool bar right next to the apartment, good for younger kids who don't want to swim in the sea. Good value of money. 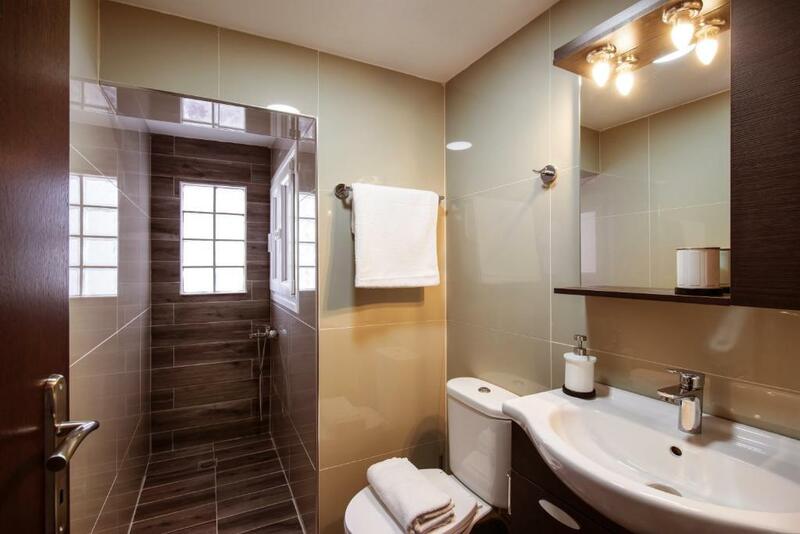 Central location, amazing soundproofing,modern rooms, great shower. Very clean. The apartment was excellent, spacious and very modern. The Manager was lovely and even arranged our transfers to airport. We will be going back. Location was excellent. It is on the front and next to sops. We loved it. Rooms were extremely clean,modern and comfortable. Mr Lambrous was exceptionally friendly, arranged taxi transfer to and from airport. Blierina was a lovely young lady. Apartments are in centre of hersoniss on main st. Next door to palm beach where you could use beds and pools. Had a great kiddies pool. All rooms have sound proof doors as can be noisy but season was ending so no problems. Location and the hotel owner was very friendly and helpful. Very clean . The bed is OK. The room is OK. The aircon works properly. The room is cleaned up seriously and every day by the maid in charge who is very kind and efficient. Lock in a great price for Dorian Boutique Apartments – rated 9.3 by recent guests! One of our top picks in Hersonissos.Located in the center of Hersonissos Town, Dorian Apartments is just 150 feet from the closest beach. 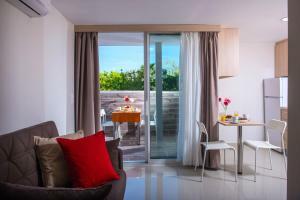 It offers self-catering accommodations types that open to a balcony with Hersonissos Town or Cretan Sea views. Free WiFi is available throughout. 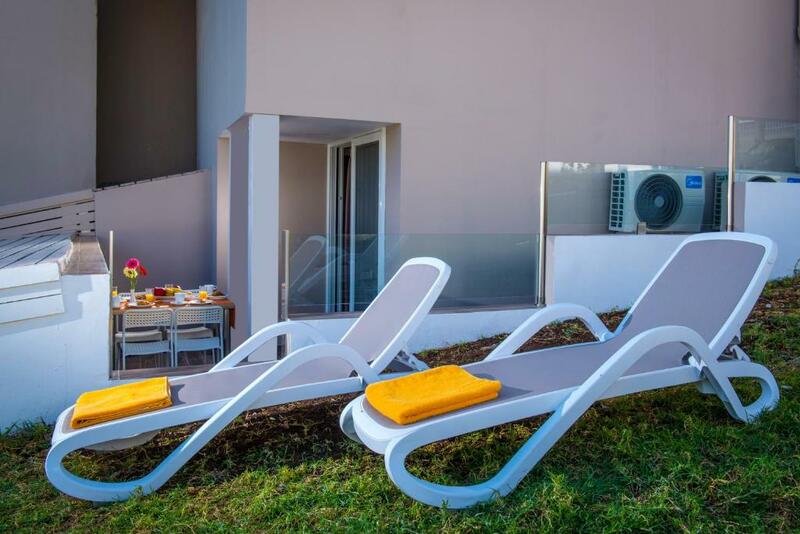 Tastefully decorated, the air-conditioned studios and apartments come with a seating area. They also have a kitchenette with a fridge, microwave and cooking hobs, and a private bathroom with a shower. Various bars and supermarkets are within proximity of Dorian Apartments. In the garden, next to the apartments, there is a pool bar serving drinks and light meals. The international airport of Heraklion is 16 mi away. You can find a bus stop within a distance of 350 feet. Free public parking is possible at a location nearby. 뀐 Located in the real heart of Hersonissos, this property has an excellent location score of 9.3! 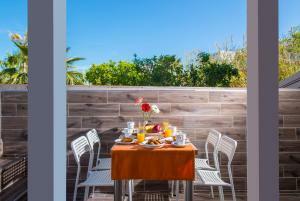 When would you like to stay at Dorian Boutique Apartments? 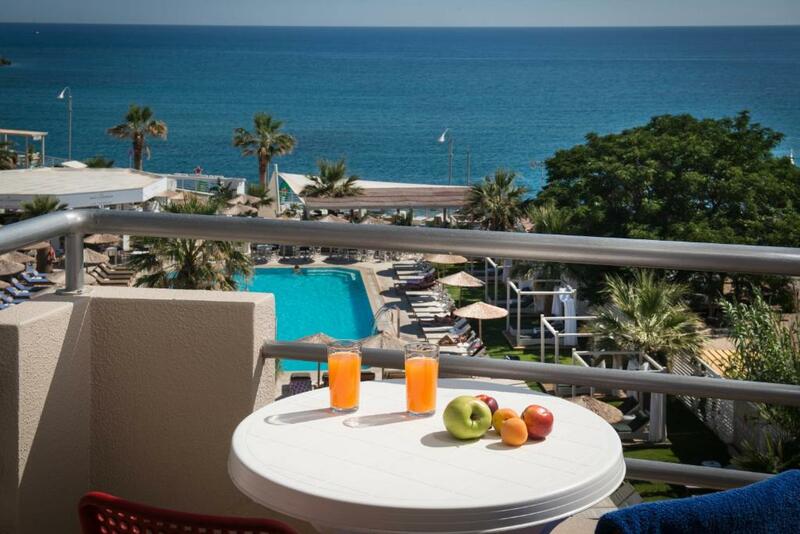 Enjoying Cretan Sea and pool views from its balcony, this air-conditioned studio offers a flat-screen TV with satellite channels. It has free WiFi, and a kitchenette with a fridge, microwave and cooking hobs. A hairdryer and an iron are included. Please note that there is a choice of a double or two single beds upon availability. 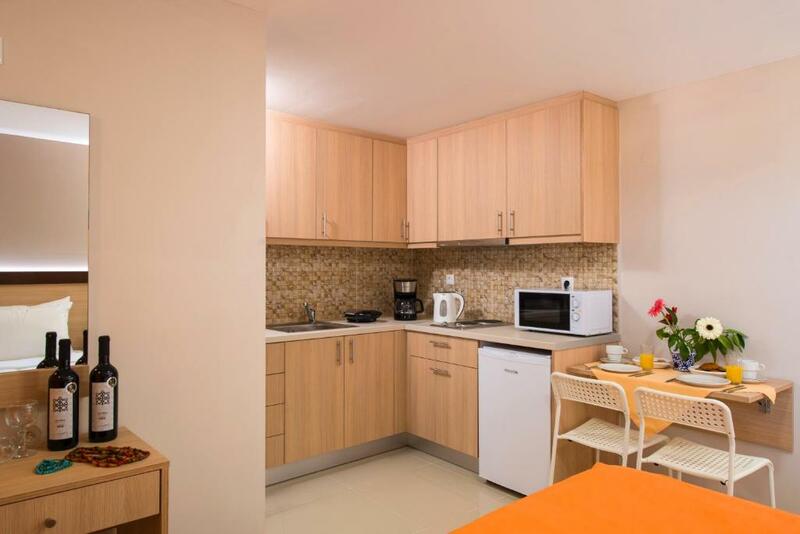 Featuring Hersonissos Town views, this air-conditioned studio offers a flat-screen TV with satellite channels. It has free WiFi, and a kitchenette with a fridge, microwave and cooking hobs. A hairdryer and an iron are included. 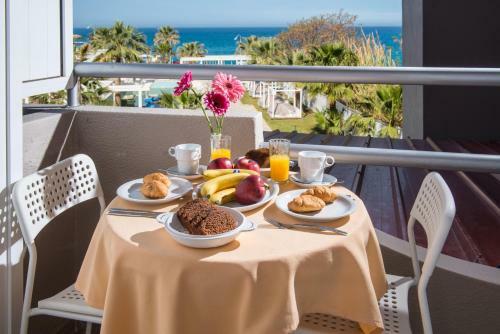 Enjoying Cretan Sea and pool views from its balcony, this air-conditioned apartment offers 2 separate bedrooms, each with a flat-screen TV with satellite channels. It features free WiFi and a kitchen with fridge, micro wave and cooking hobs. An iron and a hairdryer are included. Enjoying Cretan Sea and pool views from its balcony, this air-conditioned studio offers a flat-screen TV with satellite channels. It has free WiFi, and a kitchenette with fridge, microwave and cooking hobs. A hairdryer and an iron are included. Offering direct access to the swimming pools of the sister property, this open-plan suite offers a flat-screen TV with satellite channels. It has free WiFi, and a kitchenette with fridge, microwave and cooking hobs. A hairdryer and an iron are included. Dorian apartments, totally rebuilt on March 2015, is front of the cooperating with us, famous PALM BEACH CLUB, with pools, bars, snack bar and the No 1 in Creta, open air, next to the sea Disco!!! Dorian is the paradise for young people of any age!!! My main job is Pharmacist and my Drugstore is near by Dorian apartments, where I am owner and manager. Most of the time of the day, I love to be in Dorian with my guests, to guide them, take care of them and offer them the vacation they deserve!!! Dorian apartments are located in the old center of Hersonissos and you can find everything! Any kind of shops are existing in our neighbourhood. There are Restaurants, Bars, Snack bars, Supermarkets, Cafeterias, Souvenirs, Gold and Silver shops, Car rentals etc. There are also Doctors and Pharmacies. All you will need for your comfortable and ideal vacation are next to you! 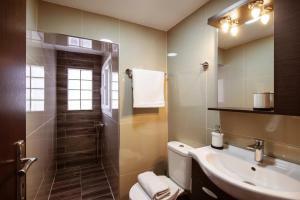 House Rules Dorian Boutique Apartments takes special requests – add in the next step! Dorian Boutique Apartments accepts these cards and reserves the right to temporarily hold an amount prior to arrival. 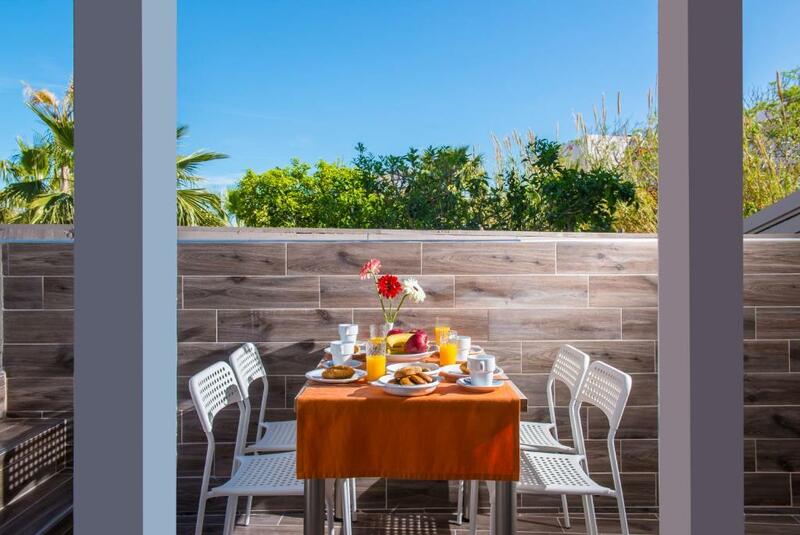 Guests at Dorian Apartments enjoy access to the facilities of a sister property including swimming pools, bars and restaurants. However, please note that the sister property is a seasonal one, thus only available from May 16 to October 7. Please inform Dorian Boutique Apartments of your expected arrival time in advance. You can use the Special Requests box when booking, or contact the property directly using the contact details in your confirmation. Some facilities were not functioning well, door could not be closed properly without a gap. And even in October the pool bar outside played music loudly till 2-3am. Too many mosquitos, although the apartment provided electrical mosquito repellentors. Not much. There is a bar outside but the shutters work well and keep the noise out. Wifii could slow down sometimes but always came back on. A lot of noise from the club nearby until 4am everyday. Nothing that we didn’t like. Very good value for money and we will definitely come back to Hersonissos and in this hotel! This is the right place to be when you are a disco addict! 20m away from the room, just under your tiny balcony, stands a large outdoor disco at work softly all day long. At night,this is another story: from Midnight to 6:00 am it is a pure nightmare! Despite windows and shutters of good quality, the music is in your room. Rest place no!! On arrival we have been told that the marvellous swimming pool you see from your room is accessible since you stay at Dorian... False! This pool is open to any public audiance in the city AS LONG AS YOU ORDER DRINKS OR FOOD! If you don't, despite what you have been told by the owner on arrival, you are simply kicked off the pool! This is a chance anyway since the pool si awfully dirty and the sunbeds are so disgusting! I did not meet that anywhere else. On the beach just underneath the disc, there are only sunbed on rent and a dirty collector spreading out directly on the beach! Under the tiny balcony on which you might have liked to have a drink before dinner, all the children of the surroundings regularly join to play soccer, yieling, screaming, howling... you can't imagine how quiet it is! Unbearable again for people wishing to have a normal resting place. The equipment of the room is poor: 2 forks, 3 to 4 knives, etc. That's it: for non disco addicts just pass your way! Thinking of that all, I am not surprised now that the owner on arrival was very quick at cashing in even without showing us the room first!! A very awful experience! The property is located directly behind palm beach club, so the rooms can be noisy however the balcony has shutters so you are able to block out this noise. Have just checked out of Dorian after a 2 night visit, as an ex pat living in Crete. We booked a city view and were luckily upgraded to a sea view. Apartment was fresh, clean, comfortable beds, and to top it all off the shower in the bathroom was amazing! We also had a welcome drink which was nice. I would recommend this place to anybody travelling to the Hersonissos area for any purpose. Lambros was fantastic. Very friendly welcome and always on hand to see if there was any problems and to say hello. Lambros even woke me up when I had overslept for my taxi. Great service.